The first step in the shopping for a diamond for an engagement ring is to narrow down the desired shape. Unless you are very certain about what your significant other would like to have it would be a very wise decision to subtly gather some input from her prior to purchasing. If she has her heart set on a round cut diamond and you present her with a pear shaped stone you are most likely not going to get the reaction you had hoped for. Do some shopping with her before hand. The where and when of the engagement can still be a surprise. Most of the shapes pictured to the right are considered to be the traditional “classic” shaped engagement diamond. Different shapes take on a different appearance on each person. Your finger size, shape of finger and skin tone all play a role in how a particular diamond will look on your hand. Trying various shapes on is the only way to truly tell how the ring will look on your hand. What looks good on your best friend may not be what suits your hand. Today, many of our clients would prefer a three stone mounting as opposed to a solitaire. There are many different side stone options (many shown below). The most important thing to keep in mind when matching up side stones is not go up or down any more than one color grade from the center stone and to make sure you have proper millimeter measurements of the center diamond in order for the side stones to fit up properly. You have many prongs to consider with a three stone ring and you want to make them as invisible as possible. 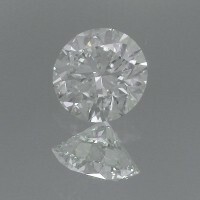 The side stones should not be any longer than the center stone and should tuck up right underneath the center diamond making it appear that it is one diamond. There are also many other cuts on the market that are advertised everyday on the radio and TV that are only available through select retail stores. The majority of these diamonds (shown below) are extremely similar to the classic cuts but are more expensive due to the marketing strategies of the retail system. Five years ago I did not know anything about diamonds or the diamond business other than the fact that I loved the product. I knew nothing about the abundance of shapes, the color and clarity for any given shape, the fact that diamonds are certified and that you should only stick with certified diamonds to make sure that you are getting exactly what you are paying for. The list went on and on of what I did not know. Now that I have been in the diamond selling business for almost six years I am never surprised that most people looking to purchase a diamond do not know any more than I did. Yes, there is a great deal of information on the web regarding the diamond buying process but that can be overwhelming to many shoppers. What shape diamond is the most popular? I always encourage our customers to try on as many different shaped diamond rings as possible. You may have fallen in love with a diamond that your friend has but it may not be the right cut for your particular hand. When in total doubt and if the proposal is going to be a complete surprise I would encourage you to chose a round cut stone. It is the easiest shape to do something else with in the future should you decide to upgrade either as an earring or a side stone. The old rule of thumb was two months salary. Again, the dollar amount is what you are comfortable with. Most people I work with either have a very specific budget or a particular carat weight that they are shooting for. I have found that the best value is just under the carat mark. For instance if you can find a round cut diamond that weighs 0.90 carats but that measures 6.5 millimeters you have a diamond that is priced less but that looks like a one carat stone. We find beautiful diamonds everyday at every price point from a budget of $1500 to over $100,000. What is considered good color and clarity? 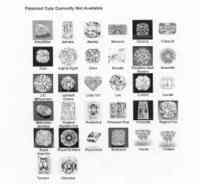 It varies from shape to shape and it depends on whether you are buying a diamond to be used for an engagement ring or for earrings or a pendant. We recommend at least I color for most shapes and at least SI1 clarity for most shapes. Some of the fancy shaped diamonds we would go up to at least H color and VS2 clarity. Obviously, again, it is personal but for every color and clarity grade you go up so does the price. Color differences can be seen and to some people higher color is very important but as far as clarity is concerned as long as the diamond is eye clean it adds no additional value to the diamond to up any higher in clarity. Do you take diamonds in for trade? Since we don't own inventory and only order in diamonds that precisely meet our client's requirements, we generally do not buy diamonds previously owned by our clients. My first suggestion is that you consider keeping your diamond and using it for a different item of jewelry such as a pendant, earrings, or a side stone for a ring. If you must sell the diamond, jewelry stores and pawn shops are the last place you should try because these establishments will often only offer a third of what they could buy it for on the wholesale market. My advice for selling a diamond you already own is to advertise in the classified section of the local newspaper in the hopes of finding a consumer who needs a diamond but does not have access to the Internet and low price suppliers like us. If the diamond you are considering selling is a GIA certified diamond we would consider brokering the diamond for you and have had great success in this area. 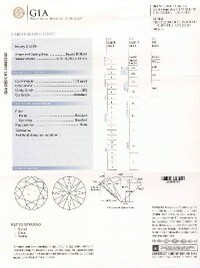 A diamond certificate (also called a "diamond grading report") is a document containing the characteristics about the diamond that will make up its value. It is the pedigree that goes with the diamond and becomes a valuable document in case of loss because it will ensure that your insurance company will replace your stone with another certified stone of like quality. Certificates are not appraisals since they do not contain any information regarding the value or price of a diamond. I have fun everyday at work talking to wonderful folks all over the country and finding them beautiful diamonds. I hope I can provide them with the information they need to make a qualified decision that they live with both financially and emotionally.